We have big ambitions within our team for our future in the Family Activities market. One of our USPs is that each programme has a ‘champion’. 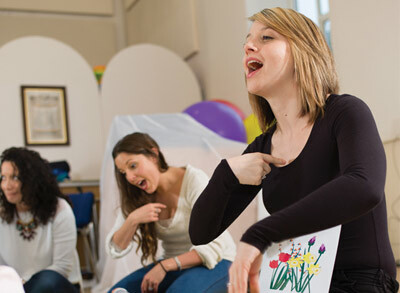 They have specialist skills and training to support the ongoing development of their programme. They also have the desire to remain the best in their field. Happily married for more than 43 years working together in Salisbury, Wiltshire. As proud parents of 4 children and a growing family of grandchildren, Howard and Lin have been involved both with our own families, and in teaching and supporting parents and children in the early-years sector for nearly 40 years. After running their our own very successful nursery school, they started adventure classes for toddlers, development classes for babies, and more recently, pre and postnatal workshops for parents. Today, they are still heavily involved in developing and improving our programmes and products to ensure that parents and children receive the highest possible quality service and the very best start in life. They truly believe that learning in a fun and exciting way builds a strong foundation for children’s emotional, social, physical and intellectual development and prepares them for a more fruitful, healthy and confident future. Among the qualifications they bring to the team, Lin holds the following; PhD, M. Phil, PGCE, FETC, BSc, Dip.Ed, SRN. Husband and wife, Ian and Keeley Sharland joined forces with Lin & Howard Day to create and grow the Baby Sensory business in 2006 using their business, legal and tech expertise. Their vision has always been to become a world class business by bringing together an excellent & committed franchise team and innovative programmes developed by subject matter experts. With the creation of the WOW umbrella brand in 2017 Ian and Keeley are now focused on the growth of the new programmes within the U.K. and further development of the WOW brand internationally. In 2016 Ian was award Industry Champion of the Year by Whatson4 as a recognition of his stature within the children’s activities industry. Emily and Sophie, the co-founders of Mini Professors, are based in Winchester where they started the classes. A biologist (Emily) and Masters of science (Sophie) both have worked in the science community before starting Mini Professors. With 3 children each and veterans of children’s classes, they noticed a lack of science-related classes and thought there might be an opportunity to provide them, using their passion for science and children. Both strongly feel that all children have a great thirst for learning from a young age and, therefore, should be given every opportunity to develop and learn new skills. With a background in science and experience of young children, they can help to nurture a love of science. Science shouldn't be boring and stuffy the way it was in their day. We hope the enthusiasm for the subject will rub off on the children who join in with our fun. Sam, a fully qualified Lifeguard and First Aid Trainer, formed KeepaBeat in 2007. Starting as a freelancer she quickly realised though that this was so much more than just a “job” when daughter Ruby arrived and quickly tested all of that First Aid knowledge in real-life situations. Seeing that many Parents wouldn’t know what to do in a First Aid emergency, Sam grew determined to pass on that knowledge. So, teaching Parents, Grandparents, Aunts, Uncles, Babysitters, Childminders and Nannies basic first aid became her new mission. Alan, son of Baby Sensory director Ian and husband of Regional Franchisee, Hannah, has long been a ‘Mr Baby Sensory’. But by taking Jasper to Toddler Sense and Mini Professors too, Alan has an enviable knowledge of all the programmes. Alan met Sam after he attended a Parental first Aid course and fell in love with the idea of spreading the good word and saving lives. Approaching Sam, a fellow drummer (Alan’s instrument with the Hoosiers), his offer to help grow the business was accepted and now, together they are on a mission to bring First Aid to everyone. Hi, I have been responsible for setting up the partnership between Baby Sensory and Photo Sensory to provide photographic services to the Wow group of companies. My passion for photography comes from being privileged to shoot live music in and around London from small clubs up to Wembley, O2 venues, and Reading Festival. My vision for Photo Sensory is to be the Photo service of choice for all Wow company customers from Maternity days, to New Born, Babies, Toddlers, Birthdays and other family events. We will achieve this by being flexible in our approach from shooting in classes, studios and customers homes. Prior to Reading Fairy, Emily published books and software to help children learn to read for international publishing houses including Ladybird and Oxford University Press. She has commissioned writers such as Julia Donaldson (author of The Gruffalo) and managed favourite character brands including Biff, Chip & Kipper and Topsy & Tim. Emily lectures at Canterbury Christchurch University as well as a wide range of other exciting activities in early years reading. Charlotte has over 20 years experience working as a teacher, consultant and educational writer. She is passionate about children’s reading and has worked on almost every major reading programme in UK schools for publishers including: Pearson Education, Oxford University Press, Collins Primary, Scholastic, and Rising Stars. As well as her educational expertise, Charlotte is passionate about children’s reading engagement. Her most recent publications include Disney activity books to support children’s literacy skills at home. Watch videos of Charlotte’s top tips for helping your child’s reading and writing at home on the Oxford Owl website.